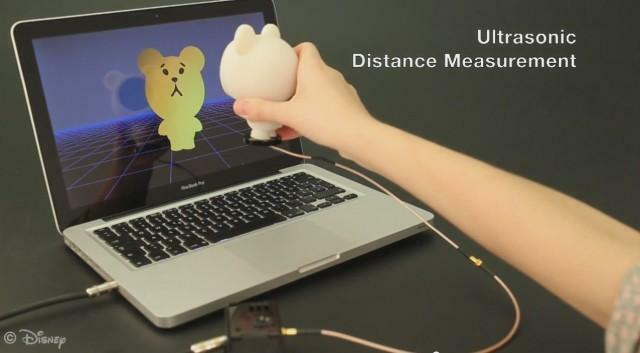 The Disney Company has revealed that it is working on 3D-printable speakers with a wide range of applications. These electrostatic speakers can reach up to 60dB and go into the ultrasonic range - something that may be beneficial when using them in multimedia applications. Disney Research, in its never-ending quest to make our menial existences more magical, can now produce 3D printed speakers of any shape. We're not just talking about a toy with a built-in speaker here -- the entire object is a speaker. As you can see in the image above and the video below, Disney has already used this technology to create some very cute and novel looking designs, all of which have the ability to play high-quality audio at fairly loud volumes (up to 60 dB). Curiously, the speakers can also go into the inaudible ultrasonic range, which could be used to track the objects as part of a larger interactive system or game. The fact that the speakers can be any shape allows for some interesting effects, too: You could make a rubber ducky that emits a directional quack from just its mouth, or perhaps a large monster that emits an angry, omnidirectional growl from all over its body. The secret sauce in this breakthrough is Disney Research's use of electrostatic speakers. Conventional speakers (in your headphones or subwoofer) use electromagnetism to move a magnet back and forth, hitting the air around it, creating sound waves (pressure waves) that your ears register as sounds. Electrostatic speakers on the other hand have no moving parts -- there's a thin, conductive diaphragm (nickel in this case) and an electrode plate, separated by a small amount of air. When current is applied to the electrode, electrostatic force deforms the diaphragm, causing it to vibrate and create sound waves. In the case of Disney Research's 3D speakers, the researchers use a 3D printer to create the object, and then spray on a nickel-based paint on the areas that should emit sound. The diaphragm is produced separately (also with a 3D printer) and sprayed with the same paint. By using multiple electrodes, it's possible to control different regions of the 3D-printed object/speaker independently, too (so, it might emit different sounds from different regions). Depending on the shape of the active region, the sound might be directional (conical) or omnidirectional (spherical). The completed device is then assembled. In the future, when 3D printers can lay down multiple materials (including conductive materials), these manual steps could be omitted and the whole thing could be made in one shot. • See more reviews in our Subwoofer Review section.